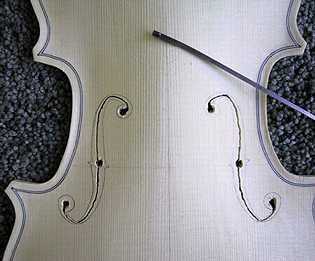 Today I spent cutting out the soundholes. I first made a plastic template of the f-hole, etching in the line even with the inner notch (this will mark the position of the bridge later). 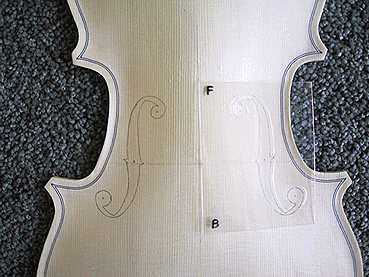 The left edge of the template (the side marked with the "F" and "B") was lined up with the centerline of the top. 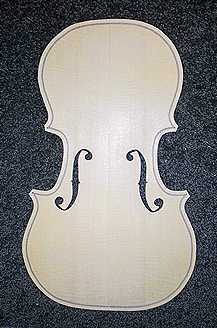 The template's notch line was placed 195mm from the top of the spruce plate. With the template positioned properly, I taped it to the top and traced the f-hole onto the top, flipping the template over to mark the other f-hole. 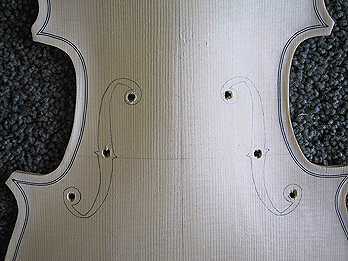 I then drilled 3/16" holes at the four holes and the areas between the notches. Next, I used a coping saw blade (handheld) to connect the sawn holes. Finally, I used an Exacto knife to carve the f-holes out, to the pencil lines. In the carving, I had to be very careful of the grain direction, or the knife might follow the grain line and chip out the spruce.